HEY! Looking for a Eagle ATV Plow? TheATVSuperStore.com test unit with our American Eagle front mount plow. Scroll to the very bottom for even more pictures. Looking for a front or mid mount Eagle plow? We have them both! These plows are by far the strongest we have tested to date. They areTheATVSuperStore.com approved! Please feel free to call us with any questions. EAGLE FRONT MOUNT PLOW SYSTEMS FOR YOUR ATV AND UTV! 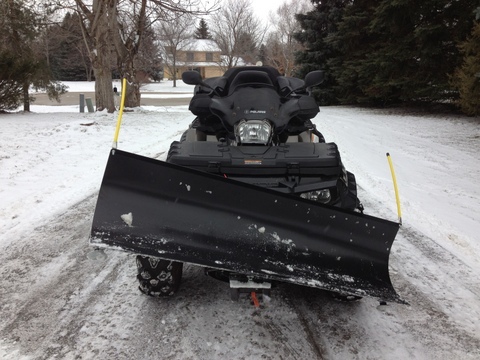 Our Complete Plow System includes 1) Plow Blade, 2) Tube Runner, 3) FRONT Mounting Kit that fits your Quad. 12 Gauge high allow steel blend. Available in Black and Yellow. 3" wide, 1/4" thick, 2 sided wear bar. 26 1/2 degree plow angle. 3/4" thick blade skids, thickest in the industry. The new FRONT plow mount system hooks up and disconnects in seconds making it one of the easiest plow mount hook ups around. One piece front mount that easily bolts on made from heavy duty 7 gauge steel. Hook up points are 5/8" round rod and use the same proven quick latch system that our regular plow has used for years. The push tubes are built out of 1 1/2" square 11 gauge tubing (the heaviest in the industry). The mount part is made of 1/4" steel. All you do is simply lift your push tubes up and roll your ATV into the mount, swing the quick latches in place, hook your winch cable to the push tubes and you are ready to go. The American Eagle has a five position adjustable blade angle with up to 26 1/2 degrees of angle. There are also adjustable blade pitch stops for maximum blade adjustment. It also features a solid 5/8" diameter blade positioning pin (largest in the industry). It comes standard with hardened 3/4" thick Ductile steel square steel tubing and has a 1/4" steel construction at all critical mounting points. To mount the plow you simply roll the ATV into the raised plow frame, and secure it with the Quick Latch. The Quick Latch bracket system features spring loaded swing latches which allows the operator to quickly attach the plow frame to the ATV mount without tools or having to line up the mounting holes. American Manufacturing's ATV Plow Attaching System is the first and only ATV plow that uses a Patent Pending two part mount. This two part system consists of a Mounting Plate and the Universal Tube Frame Mount. Once the Mounting Plate is attached to the ATV you can simply slide on the Universal Tube Frame Mount and tighten four bolts. Before trail riding you simply loosen the same four bolts and slide the Universal Tube Frame Mount off. This system has the benefit of no loss of ground clearance, or any hanging parts to catch or bend. As an added bonus the Mounting Plate also doubles as a heavy-duty skid plate. 12 gauge high alloy steel blend is 40% stronger by weight than other blades. Get the job done it 1/2 the time with our optional turn systems made to fit the Eagle Plow System! Here are more pictures of our quick connect American Eagle front mount plow system with the optional Electric Turn System (ETS). Perfect option for your Eagle plow systems up to 60 inches wide. Over 60 inches we suggest getting the Hydro Turn System. Any questions or for even more pictures of this awesome plow system feel free to email or call us at 815-321-3888.